For the 2018 model year, Jeep will be offering both the Wrangler JK as well as the much anticipated new Wrangler JL. While the redesigned JL/JLU will not make it to production until Q1/Q2 of next year, the 2018 JK/JKU models are on the dealer lots now and BDS Suspension has the full lineup of suspension lift options and accessories in stock and ready to ship. Available in sizes from 2" spacer kits up to 6.5" 4-link long arm systems, BDS has a kit to meet your needs. These kits are a carryover from 2007-2017 Wrangler JK listings and have been confirmed compatible with the 2018 models. All BDS kits include the No Fine Print Warranty and are designed to improve the performance, capability, and curb appeal of the new Wrangler JK without sacrificing drivability. 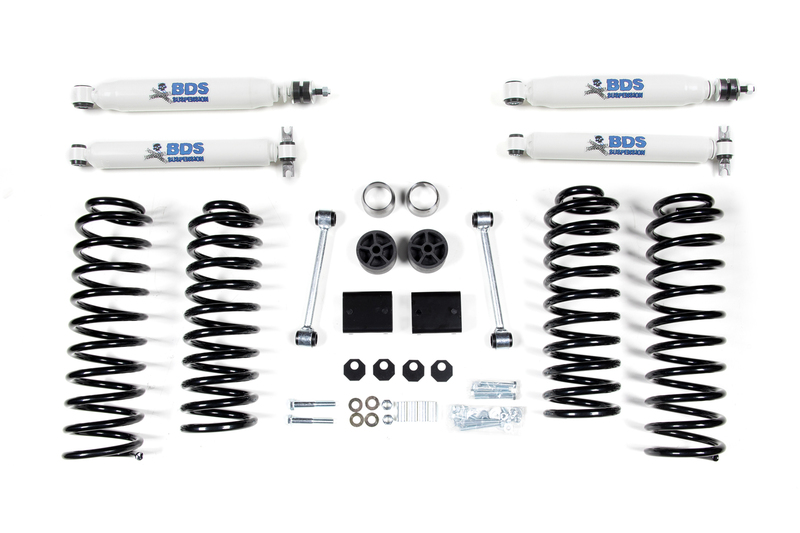 As with all BDS lift kits, these are backed by Factory Protection Plus for BDS's No Fine Print Warranty, 5-year 100,000-mile drivetrain warranty and FMVSS No.126 compliance*. Take your 2018 Jeep JK to new heights with BDS Suspension. 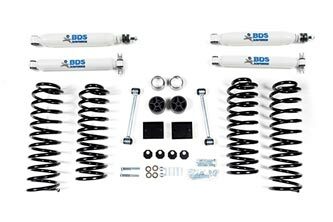 2" Lift Kits: For those looking for a mild lift kit, BDS offers a coil spacer kit designed to provide 2" of lift while retaining the stock ride quality and road mannerisms. 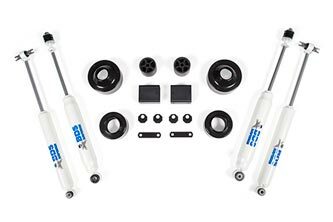 The kit uses urethane coil spacers, front and rear bump stop extensions, extended sway bar links, octo-cam alignment washers, exhaust extensions, and your choice of NX2-series or Fox 2.0 gas shocks. The 2" lift kit is also offered with replacement coils (4Dr. only) for improved handling and articulation. 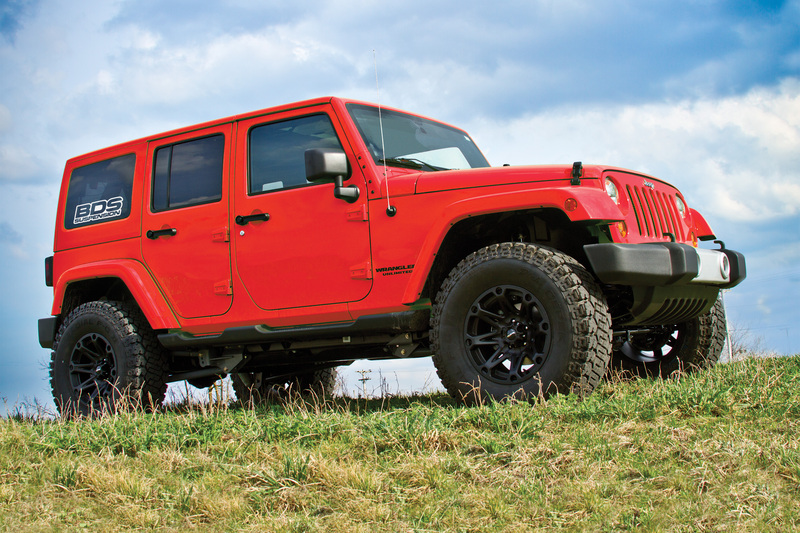 3" Lift Kits: Stepping up to the 3" lift kit, BDS offers kit options for both JK and JKU to improve trail capability without sacrificing on-road performance. The 3" lift kit includes ProRide coil springs, BDS swaybar disconnects, bump stop extensions, octo-cam alignment washers, brake line extensions, exhaust extensions, rear trackbar bracket, and choice of BDS-NX2 or Fox 2.0 shocks. This is a popular size for Jeeps planning to run 35" tires. 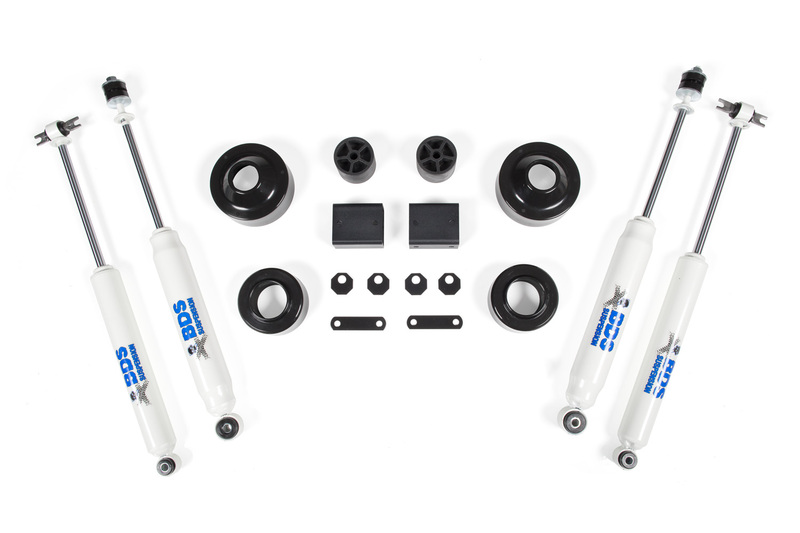 4-4.5" Lift Kits: The 4-4.5" lift kits offer improved all-around performance and feature ProRide coil springs and front/rear lower control arms in your choice of fixed length or adjustable with forged flex ends and either poly or rubber bushings. Rear adjustable upper control arms are also included to allow the rear pinion angle to be dialed in. 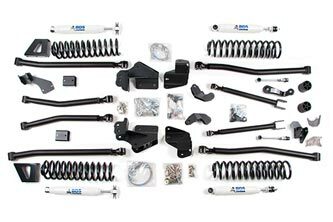 These kits also use front swaybar disconnects and rear links as well as bump stop extensions, brake line brackets and exhaust extensions. Steering is corrected via a forged drop pitman arm and new front/rear track bar brackets recenter the axles. Kits include your choice of BDS-NX2 or Fox 2.0 shocks. 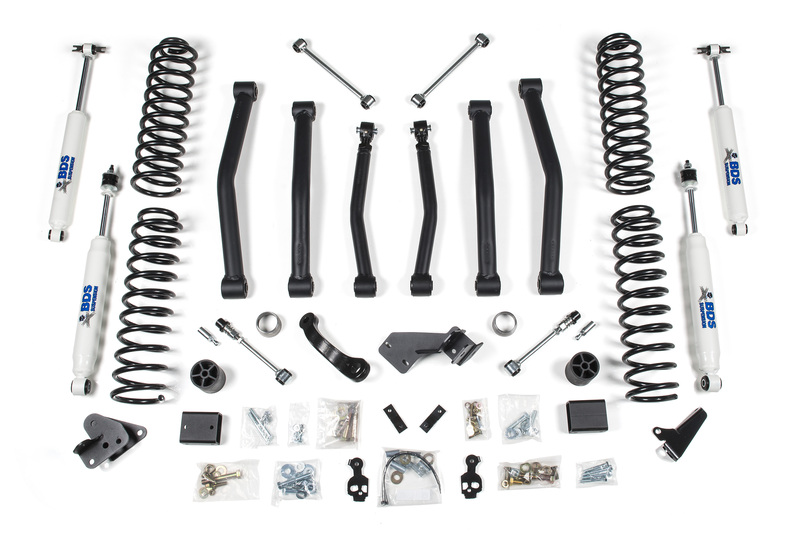 4-6.5" Long Arm Kits: For the best overall performance out of your lifted JK, BDS offers long arm suspension kits in heights from 4" to 6.5" of lift, engineered to give you best performance offroad without sacrificing the handling on-road. These kits upgrade the factory 4-link suspension to a longer 4-link design that offers increased articulation and better control throughout wheel travel. Heavy duty upper and lower adjustable control arms feature forged flex ends and your choice of interchangeable rubber of poly bushings to install into the new 1/4" steel bolt-on mounts. Steering is corrected with a forged drop pitman arm and your choice of front and rear track bar brackets or adjustable track bars to recenter the axles. 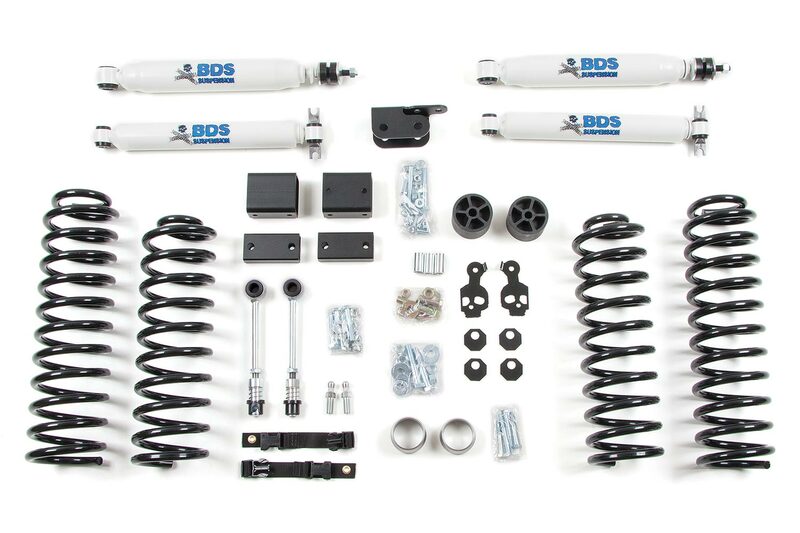 Kits also include bump stop extensions, sway bar disconnects and relocation brackets, front and rear Kevlar-lined SS brake lines, and your choice of BDS NX2 or Fox 2.0 shocks. 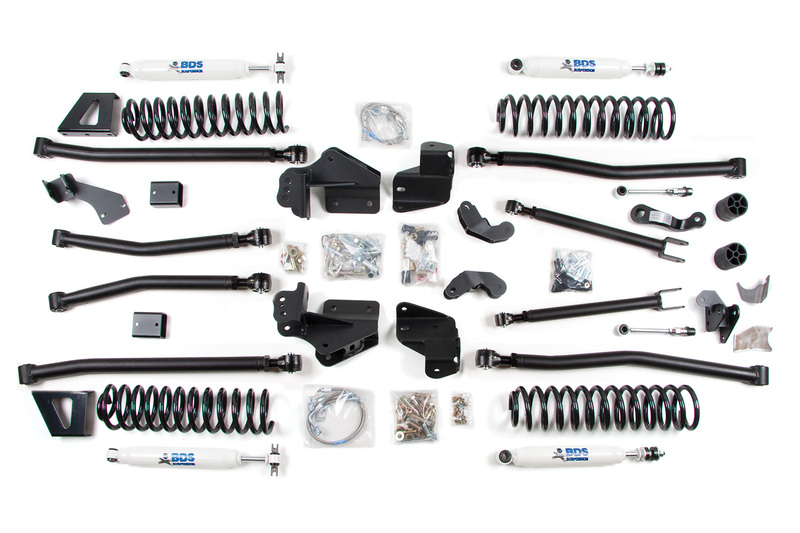 Accessories: In addition to all the kits, BDS Suspension offers a number of accessories for the 2018 Jeep Wrangler JK/JKU including front and rear heavy duty adjustable track bars, fixed and adjustable length control arms, long arm upgrades, sinle and dual steering stabilizer kits, kevlar-lined SS brake lines, bar pin eliminators, FOX 2.0 shocks, cam bolts and more. 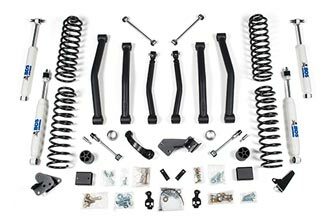 For a full listing of all the 2018 Jeep JK products, check out the BDS Suspension website or call (517) 279-2135.